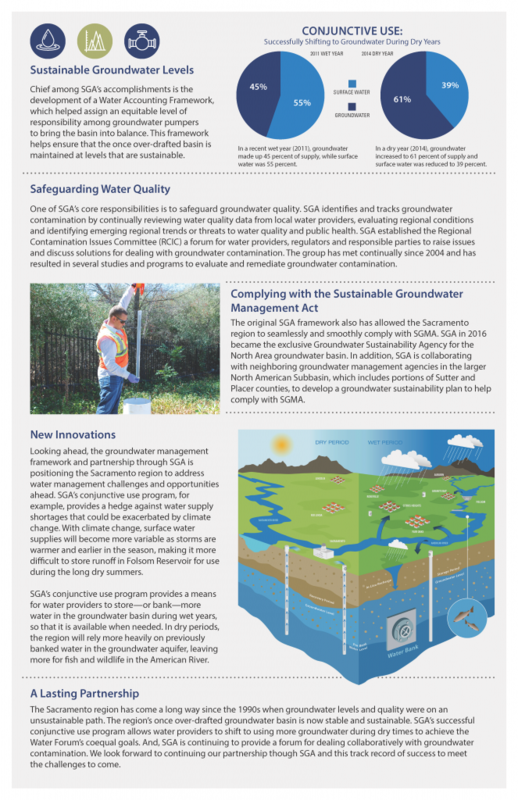 The Sacramento Groundwater Authority (SGA) recently celebrated its 20th anniversary, which offered an opportunity to reflect upon and think about the importance of sustainable groundwater management and the efforts required by local agencies for effective conjunctive management of surface and groundwater resources. When the SGA was created in 1998, the region’s water supplies and environmental resources were on an unsustainable path, leading the region’s leaders to come together around the SGA and the Water Forum to re-imagine how water could be more effectively managed for multiple benefits. The need for a healthy American River and groundwater basin led to innovative conjunctive management throughout the region through the various programs described in more detail below. 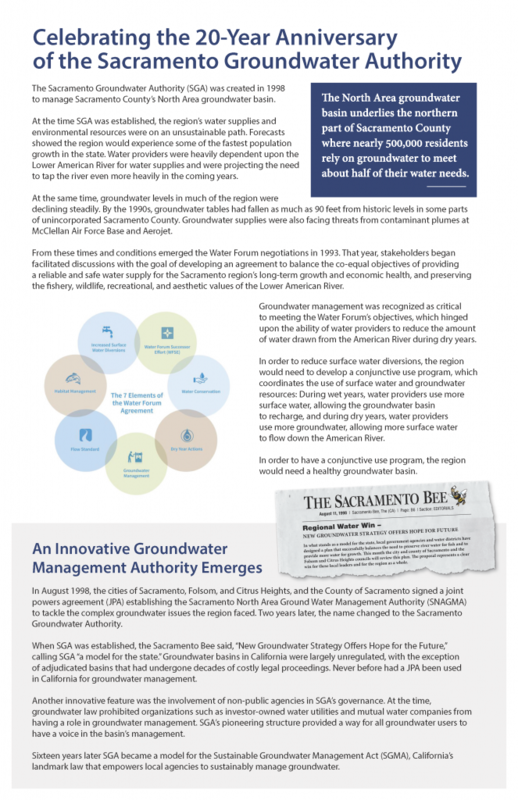 As a result of these sustained efforts, the Sacramento area is on the leading edge of implementing the Sustainable Groundwater Management Act (SGMA) and serving water to meet the goals of both the Water Forum and the State of California. We laud these efforts for 21st century water resources management and congratulate the SGA for 20 years of progress. Click here for a larger view of the document below. For more details on the SGA, see its 20th Anniversary. For more details on the Sacramento Valley floor, see the Fact Sheet: State of Sacramento Valley Groundwater.